Until this past Sunday, I had never baked a pie from scratch. I mean, I’ve baked a million other things from scratch: cakes, tarts, cookies, bread, puff pastry, etc. In fact, these days, I don’t bake anything that isn’t from scratch. (Please know, though, that I’m not some uptight baking snob; like I told my friend Laura the other day: “Cake mix and canned frosting sell because they are delicious.”) I think part of the reason I never got around to it is because I have been with my husband for the past ten years, a time frame that completely encompasses my journey as a cook. And let me tell you, his grandmother makes amazing pies. A-mazing. She’d make a pie for every family gathering (except once, when Dr. O’s cousin’s then-girlfriend helpfully volunteered to make dessert; we were all crushed), and for as delicious as dinner always was, we couldn’t wait for dessert. Since I’ve been on a roll with doughs these days, I figured it was time for me to at least attempt a pie. My favorite kind of pie is cherry, but the harvest season and chilly weather made apple an appropriate pick. Dr. O’s grandmother always said that the key to a flaky, delicious pie crust is to use both butter and shortening, so I decided to use Martha Stewart’s Perfect Pie Crust recipe. Finally, I liked the sound of the filling in Martha’s Old-Fashioned Apple Pie, so I just subbed the other crust for the pate brisee called for in the recipe. I used the food processor method to make the crust; if you have extra reserves of arm strength and want to use a pastry blender, the recipe includes instructions for that method as well. In the smallest bowl of my food processor, I combined 2 cups of all-purpose flour and 1/2 teaspoon of salt. I added 1 1/2 sticks of very cold unsalted butter and 3 tablespoons of chilled vegetable shortening (Crisco), cut into smallish pieces (about a tablespoon each). Once all of the ingredients were in, I processed the mixture for a few seconds until it resembled coarse meal. To bring the dough together, I added ice water bit by bit, processing very briefly after each addition (no more than 20 – 30 seconds total). The recipe calls for 1/4 cup of the ice water, but says the key to light, flaky pastry is to add as little water as possible and to process the dough as little as possible. I just added water and processed until the dough really started coming together on my food processor blades; I didn’t end up using the entire 1/4 cup. Once the dough had formed, I wrapped it in plastic wrap and chilled it for an hour. Peeling, coring, and slicing apples seems to be an eternal task for me, so I decided to use the dough chilling time to get the pie filling ready. I don’t have one of those crank apple peelers (though I’ll take your reviews if you’ve used one), so I used a vegetable peeler to remove the skin from 4 pounds of Jonathan apples. I cut each apple in half, cut the halves in half, cut out the core, and then sliced each quarter into 1/4- to 1/2-inch slices. After throwing all the apple slices into a large bowl, I added 3 tablespoons of fresh lemon juice, 1/2 cup of sugar, 5 tablespoons of all-purpose flour, 1/4 teaspoon of ground cinnamon, 1/4 teaspoon of ground nutmeg, and 1/4 teaspoon of salt, tossing the mixture to combine. I covered the filling with plastic wrap and put it in the refrigerator until I was ready to fill the pie. Once the dough finished chilling, I lightly floured my clean kitchen counter, divided the dough into two halves, and patted each half into a flat round. Using a lightly floured rolling pin, I rolled the first half into a 13-inch round (about 1/8-inch thick). I fit the dough into a 9-inch pie plate (take care not to stretch it) and trimmed the edges of the dough to be flush with the rim. I placed the crust in the freezer for 30 minutes. For the second dough half, I placed a large piece of parchment paper on the counter, placed the dough on the parchment, and rolled another 13-inch round. I placed the parchment (with the dough on it) on a baking sheet and transferred it to the refrigerator to chill for 30 minutes. Once the 30 minutes had elapsed, I removed the crust from the freezer, filled it with the apple mixture (see below), and dotted it with 1/2 stick of unsalted butter (cut into 1/2-inch pieces). I was able to fit almost all of the apple slices into the pie crust, leaving only a few slices behind in the bowl. I lightly brushed the edges of the pie with a wet pastry brush. Next, I placed the refrigerated dough round over the top of the apples, trimmed the edges, and pressed them to seal. I have to tell you, I think this would have been easier if I had chosen to use a more traditional pie plate instead of one with extended sides and built-in handles; it was hard to get a good pinch in to crimp the dough. Live and learn, right? Anyway, I cut four 1/2-inch slits in the top of the pie for venting, whisked together an egg yolk and 1 tablespoon of heavy cream to make an egg wash, and used my pastry brush to brush the top of the pie with it. (I didn’t use all of the egg wash.) I sprinkled the pie with sanding sugar and put it back in the freezer to rest for 30 minutes before baking. When the resting time was over, I put the pie on a baking sheet and baked it for 20 minutes at 400F. (Transferring a pie in a glass pie plate directly from the freezer to the oven made me nervous, by the way, but I guess Pyrex is built for it.) After those first 20 minutes, I dropped the temperature to 350F and baked it until it was golden brown and bubbling. (The recipe had indicated an additional 35 minutes; mine didn’t seem done until the 45-minute mark, but everything seems to take longer at altitude.) I removed the pie from the oven and set it on a wire rack to cool. Ideally, one lets a pie cool to room temperature before cutting it to let things set up properly. Dr. O and I just couldn’t stand smelling the pie without having a slice in front of us. I only let it cool for about 45 minutes before cutting it, so it was pretty warm and oozy. Based on how things set up as it sat, though, I think there’s enough flour in the filling to prevent this from being a runny pie. Next time, I’ll have to factor in plenty of cooling time (preferably when Dr. O isn’t home) so I’ll know for sure. It wasn’t quite grandma’s pie, but it was a valiant (and delicious) first attempt, I think. Maybe things just taste better when grandmothers make them? 🙂 The crust was definitely light and flaky, and I’m a huge fan of the slight crunch the sanding sugar adds to that top layer. The filling was adequately sweet with just a hint of tartness. The only thing I’d change is that I’d slice the apples thinner. They were all tender, but I like mine to be very soft (but not mushy, of course). Sticking to 1/4-inch slices would probably do it. From-scratch pie certainly isn’t quick or exceptionally easy, which is probably another reason it took me so long to make one. Including resting time, the pie took almost 4 hours, and that’s just pulling it out of the oven. 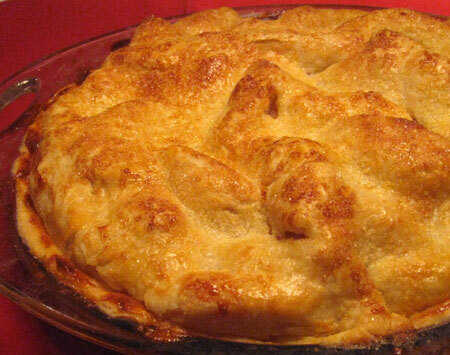 Still, when you think about pre-made crust and canned apple filling as opposed to the real thing, it was absolutely worth it. 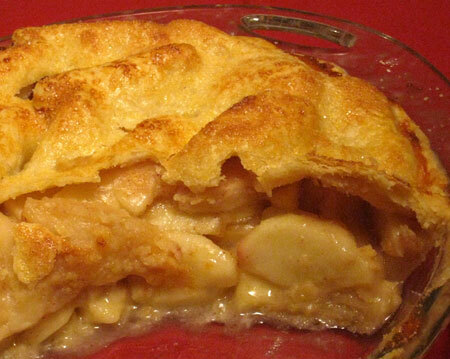 TIPS: You can use any pie-appropriate apples you like with this recipe, of course. I’ve heard good things about Jonathan, McIntosh, Golden Delicious (preferably from New York), and Cortland apples. Granny Smiths work well if you like a pie on the tart side. Feel free to share other favorites! Your crust looks awesome! But I think you’re right…things always taste better when grandma makes them, haha. It looks tasty though! With your love of cooking/baking, I knew you would be the one to carry on where Grandma Ozenbaugh left off with her amazing pies. For Christmas, I have asked her to give us all a “hands on” lesson in the secret of her perfect pie crust – but it looks like you may have a pretty good one here! You’ve done such a great job with this website – from the looks of it, Brian must feel like he is in food heaven! !